UNDERSTANDING COMMON PATTERNS IN MUSIC CAN BE A TREMENDOUS HELP TO LEARNING GUITAR. Common chord patterns are chords arranged into a certain order within a song. Explaining the concept of common chord patterns and chord families is actually quite easy to grasp. Common chord patterns are short expressions of chords. There are around three or four chords that are regularly used in almost all of the most popular music. Therefore, learning and practicing chord patterns is a lot easier and faster than playing one chord at a time. Instead of just haphazardly changing chords, it's a great deal more productive to practice common chord patterns. As common chord patterns are what you will find in most songs, it only makes common sense to learn this way. Learning individual chords can be very awkward when first starting off. Actually, learning individual chords is not difficult, the difficulty lies in going from one chord to another effortlessly. Fundamentally, you are not learning one chord at a time, what you need to learn is moving from one chord to another smoothly and in time. Using the chord families can make that happen a great deal more quickly. The foundation of common chord patterns is chord families. By counting the musical alphabet, you get one, four and five. For instance, in the key of “C”, C is one, “F” is four and “G” would be five. (C, F and G). These are called primary chords and are the most common and basic foundation. Universally, many tunes are a composition of three chords and those three most commonly used are 1-4-5 in the key. This is why it makes perfect sense to practice 1-4-5 chords in the most popular keys for guitar. If you are just starting out learning the guitar, it is advisable that you start off with the easiest keys. These are keys that contain the simplest chords to master and you should get through them in a very short period of time. THESE ARE THE MOST POPULAR AND UNIVERSAL KEYS FOR THE GUITAR. ALL FLAT AND SHARP KEYS REQUIRE BAR CHORDS. 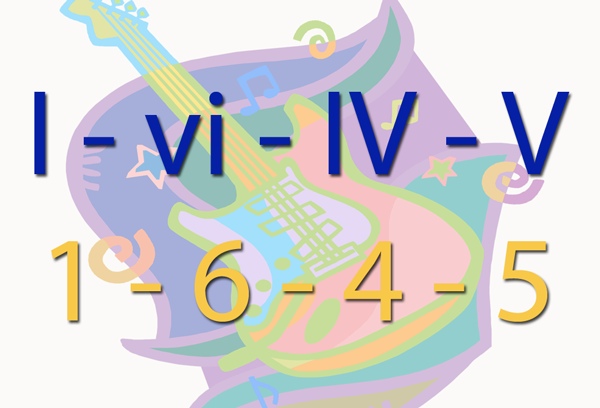 To learn more regarding music theory, check out "The Roman Numeral System Explained". In a nutshell, practicing and becoming familiar with these chords will help you learn the guitar in a relatively fast period of time. As you continue to learn you will find you can pick up your timing a little faster and your frustrations will slip away. Hi Tomas – I do believe you’ve saved me many months of practice/work learning to play the guitar and the keyboard! Bless you! I have hills and valleys. This information has started me back up the hill! In a short time, I am getting my head out of music books, & breathing fresh air, as well as finding that I am making progress. ( and having fun)! I sincerely appreciate your age. Learning and playing guitar really knows no bounds. You may have loss your youthful vigor or appearance but not the self-confidence, determination and enthusiasm to pursue learning guitar. Finding my lesson as first rate is overwhelming. Thank you, Lany and I am so happy to know that you are making progress and you’re having fun. I assure you that playing guitar is going to be your lifelong source of enjoyment. One of many beautiful ways of connecting with your granddaughter – playing guitar together. What a joy!